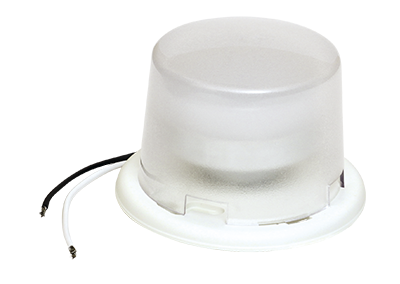 Exclusively from EPCO, our 9-Watt LED Keyless and Pull Chain Luminaires’ low profile illumination is ideal for small area lighting applications. Offering optimum lighting performance and energy efficiency, the annual operating cost is $5.52, an 85% savings vs. an incandescent lamp, a 31% saving vs. a compact fluorescent lamp. Just another innovation from EPCO designed to save you energy and money! 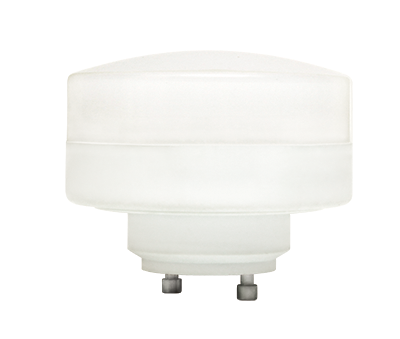 Includes 9-Watt LED Bi-Pin Lamp and Polycarbonate Diffuser. Meets the requirements of the 2017 National Electrical Code: Articles 410.16(A)(1)(3), 410.52, 410.74(A)(B). Annual Energy Savings using a 9-watt vs. a 60-watt = 85% or $31.23 Savings! *The kWh of electricity used per day is 1.44 kWh for a 60-watt Incandescent Lamp vs. 0.312 kWh for a 9-watt LED Lamp based on operating 24 hours a day, 365 days at $0.07 per kWh per day. Your actual savings will vary based on the amount of electricity you use and your supplier's cost per day may be more or less than the estimated savings presented in this example. Engineered Products Company warrants at its sole option after a failure is confirmed as a true defect in materials or workmanship, Engineered Products Company will replace, or refund, any 9-Watt LED Keyless and Pull Chain Luminaires for a period of three (3) years from the original date of purchase. This Warranty Statement applies only to the original purchaser. To obtain a replacement for the 9-Watt LED Luminaire, or to obtain a credit memo under this warranty, the Purchaser must contact Engineered Products Company within the specified warranty period to obtain a Return Materials Authorization (RMA) form and return shipping instructions. Engineered Products Company shall have no responsibility for any 9-Watt LED Luminaire deemed “out of warranty”. Under no circumstances shall Engineered Products Company be liable for any loss or damage, whether direct or indirect, incidental, consequential, special or otherwise, arising out of or relating to the use of, or the inability to use the 9-Watt LED Luminaire in excess of the cost for replacement of a 9-Watt LED Luminaire proven to be defective during the specified Warranty period. THIS WARRANTY IS THE PURCHASER’S SOLE AND EXCLUSIVE REMEDY FOR ANY CLAIM, WHETHER IN CONTRACT, TORT, OR OTHERWISE, AND IS IN LIEU OF ANY OTHER WARRANTY, WHETHER EXPRESS, IMPLIED OR STATUTORY, INCLUDING, BUT NOT LIMITED TO, ANY WARRANTY OF MERCHANTABILITY, FITNESS FOR A PARTICULAR PURPOSE OR ANY WARRANTY OF NONINFRINGEMENT OF THE INTELLECTUAL PROPERTY RIGHT OF THIRD PARTIES. ALL SUCH WARRANTIES ARE HEREBY EXPRESSLY DISCLAIMED. A 9-Watt LED Luminaire that has been incorrectly installed by drilling holes, puncturing, piercing the base of the luminaire, or any other means that will alter the finished integrity of the luminaire. Damage caused by the use of parts, components, or other equipment(s) such as a dimmer switches or other lighting control systems that are not compatible, suitable, or authorized by Engineered Products Company. Damage resulting from use of the 9-Watt LED Luminaire in what Engineered Products Company, at its sole discretion, considers extreme installation applications such as damp or wet locations. Product damage as determined by Engineered Products Company to be caused by a crash, impact, or obvious signs of abuse to the 9-Watt LED Luminaire. 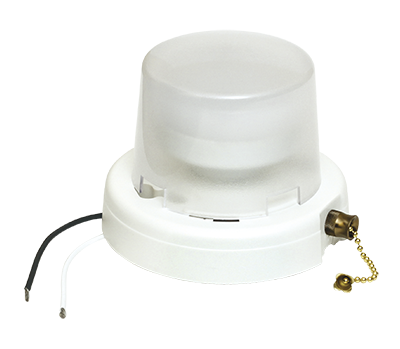 A 9-Watt LED Luminaire manufacture date code or serial number that has been erased or altered. There are absolutely no labor charge-backs or labor allowance to remove, re-install, or re-power the 9-Watt LED Luminaire.